I Ate Chocolate Molten Cake with No Guilt! It’s Visible Monday, so head over at see what other wonderful bloggers are doing! Going to see IronMan 3 is the perfect afternnon outing on a day where it’s drizzling… We all had a great time and I got the biggest kick out of watching my youngest laughing so hard . 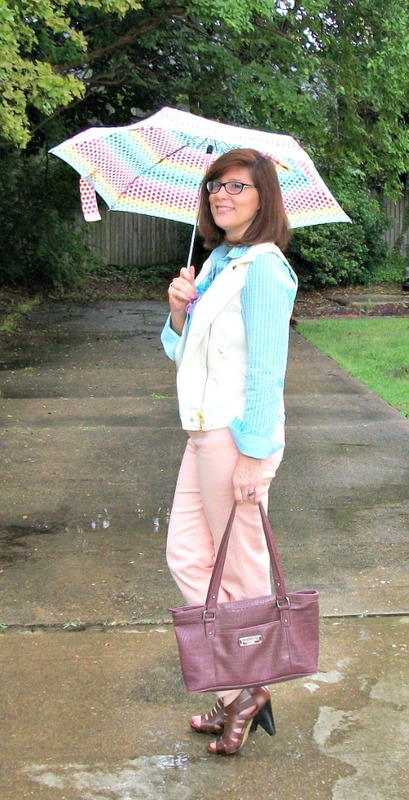 I loved how the colors of my umbrella worked so well with this outfit…And I loved the compliment from the girl at a store we stopped into that started by complimenting my shoes and asking if they were comfortable. These are my newer Franco Sarto”s purchased on Ebay and I highly recommend them for comfort. After the initial compliment she went on to tell me she really liked my entire outfit. My husband just smiled. He gets such a kick out of this when it happens. It also makes him do a double take and see me in a new light and pridefully compliment my style choices even though he had previously done so before I left the house. This new necklace was found at Burlington Coat Factory for just $7.99 and came with matching earrings. Dear Readers, I haven’t had the edgy feeling I like in outfits so much recently,but the vest and shoes here really gave me that vibe. I like that the colors are quite the opposite of edgy and very feminine. I highly recommend checking out thrift stores for blouses. I am constantly surprised at how lke new and what great brands are available for just a fraction of retail pricing. I’ve never been much of a blouse wearer,but am totally sold on them lately. Do you like wearing blouses? What style of top is your favorite? Gratitude: I am grateful for a fun weekend. I am grateful for spending time with friends on Saturday night and the laughter and fun we had together… I am grateful for couple friends were we all get along. I am grateful for time spent with the kids on Sunday. I am grateful to my husband for all his hard work in being the sole bread winner for our family. I am grateful for laughter and the recharging of my spirit. I am grateful to my three youngest who cleaned the kitchen while I was out with friends Saturday night and the joy Sunday morning when all I had to do was unload the clean dishwasher. 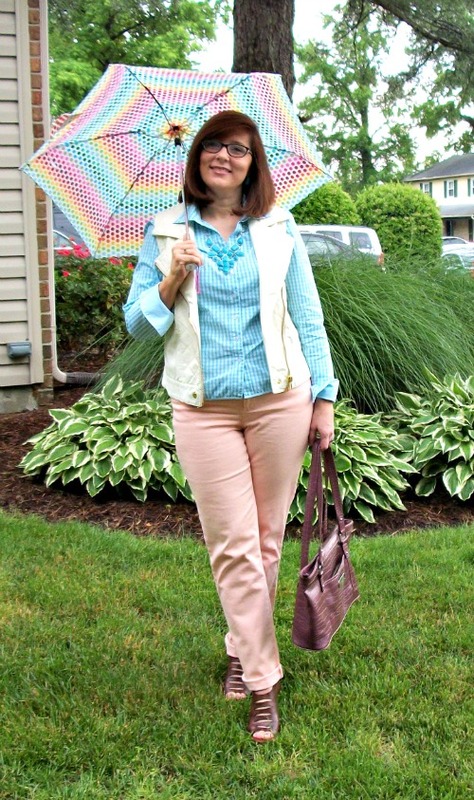 8 Responses to "Aqua & Blush"
What a great outfit for family movie day, so cute! I can see why you got compliments. Thanks for sharing with Visible Monday. I though the same about the whole outfit, the whole pieces including the umbrella look like they belong together! My boys have been bugging me to go and watch Iron Man 3, maybe I’ll take them this weekend.. any good? Sorry just found your comment in my Spam folder,,, Yes the movie was wonderful and everyone of us agreed… that’s a big deal for the five of us to all like a movie… thanks for commenting! 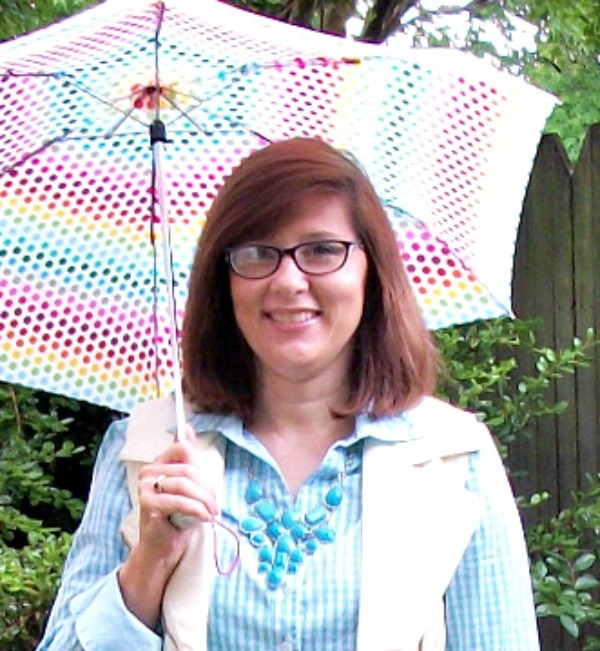 Your umbrella is the perfect accessory with your outfit. I really like this look, especially the vest! You are right, there are some great blouses to be found at the thrift stores. Tracey, these colors are a dream on you! I love all of it, but I’m seriously coveting those blush jeans and the Franco Sarto shoes. Hubby is a big fan of Iron Man, too so we’ve seen it as well. I thought it was terrific. thank you and we all loved the movie. Really well put together, as you already know! Couldn’t imagine your outfit being as effective without your necklace … you did a great job. Casual, unselfconscious … very pretty. Thank you and I totally agree about eh necklace carrying the entire look!